Blog / Events / Medieval Harvest Festival this weekend in San Gimignano! 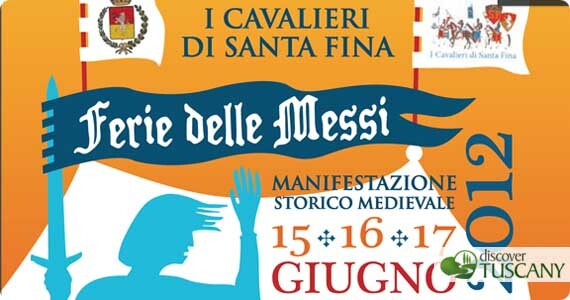 The Ferie delle Messi or Medieval Harvest Festival returns to San Gimignano this weekend! The festival represents an ancient feast that commemorates the cavalier tradition of San Gimignano. The association of the “Knights of S. Fina” organizes this festival rich in cultural events every June to give visitors the chance to step back in time and to appreciate this lost tradition. This weekend from June 15th through the 17th throughout the town of San Gimignano you can attend the arts and crafts market, participate in many medieval games, see the parade in Medieval costume, the Grand Procession and the “Giostra dei Bastioni”, the horse race in which the 4 neighborhoods of the town compete against each other to win the precious Gold Sword! For more information about the festival, read the article: Medieval Harvest Festival!